Russia’s central bank this week lowered its main interest rates for the seventh time since April 24 - lowering the refinancing rate a further quarter percentage point. The decision came hard on the heels of the announcement that the Russian economy suffered a record economic contraction in the second three months of the year and refelect the growing recognition that the country now faces a painfully slow recovery. Just how painful things might become will form the subject matter of this report. You can also download the full text in PDF if you prefer to print and read - Bank Rossii Eases Further As Russia's Economy Contracts At A Record Rate. Bank Rossii cut the refinancing rate to 10.5 percent from 10.75 percent (following a quarter point reduction on August 10), and lowered the repurchase rate charged on central bank loans to 9.5 percent from 9.75 percent, effective from tomorrow. The bank has now cut the rates six times since April 24. 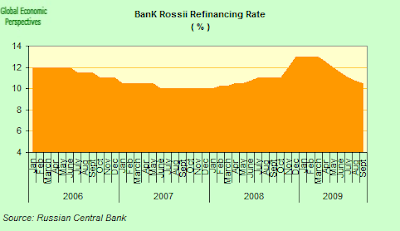 Nonetheless Russia’s benchmark refinancing rate is still the second-highest in Europe, after the 12% on offer in Serbia and Iceland - meaning ruble denominated assets remain an attractive carry pair with either Euro or USD, and that with inflation stuck around the 12% mark the problems for central bank monetary policy are legion. In the report that follows I will argue how the steady and systematic long term mismanagement of Russia's monetary policy has now created a veritable Procrustean bed of problems for Russia's economy and society. Failure to address the underlying inflation problem between 2005 and 2008 meant that large structural distrortions were accumulated in the economy, including a massive problem of commodity export dependence, a problem which effectively turned the country into a veritable disaster waiting to happen if ever there should be a protracted lull in the secular rise in energy prices. That lull has now arrived, and it is not at all clear just for how long we will all need to get to learn to live with it. Added to all this, the economy will clearly not rebound as easily as many seem to foresee, adding to the risk element on all fronts. 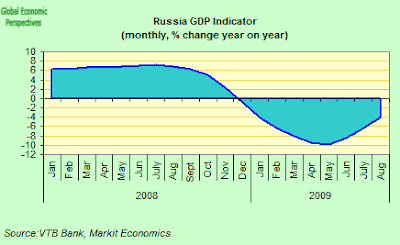 The Russian Economy Ministry seem to be getting ahead of themselves at the moment, since following a period when they have tried to get the bad news all out up front, just last week they decided to raise their 2010 forecast to a growth of 1.6 percent - up from the previous 1 percent forecast. This growth, if realised, would follow an anticipated shrinkage of some 8.5 percent this year, based on the September 9 estimate of Economy Minister Elvira Nabiullina that output may grow 3.9 percent to 4.5 percent in the second half of this year compared with the first six months - such strong optimism I find hard to accept, unless the turnround in global economic activity turns out to be much stronger than the one we are currently seeing. Is The Worst Really Behind Us? Gross domestic product contracted an annual 10.9 percent in the second quarter, according to the Federal Statistics Service. The headline number represented a worsening in the year on year performance following a 9.8 percent contraction in the first quarter. 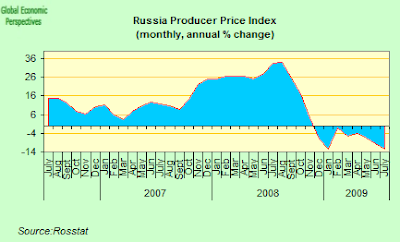 Evidently the Russian economy has been extremely hard hit by the worst global financial crisis since the Great Depression as demand for Russia’s oil, natural gas and metals (around 80% of total ex-CIS exports), and industrial production plunged as companies depleted stocks and struggled to raise funds during the credit crunch. Manufacturing contracted an annual 18.7 percent in the quarter compared with a 23.5 percent drop in the first quarter, while construction was down 20.5 percent in the period following a 20.9 percent annual decline in the first three months. Retail sales fell an annual 11.3 percent, more than twice the pace of decline in the first quarter when they shrank by 4.9 percent. Capital investment slumped by an annual 23.1 percent in May, the most since December 1998. 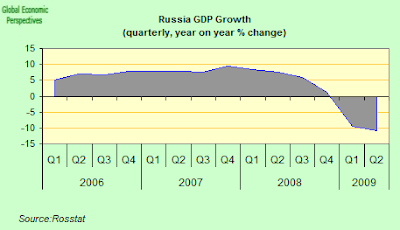 The Russian government forecasts that GDP may fall by as much as 8.5 percent for all of 2009, following growth of 5.6 percent in 2008 and 8.1 percent in 2007. 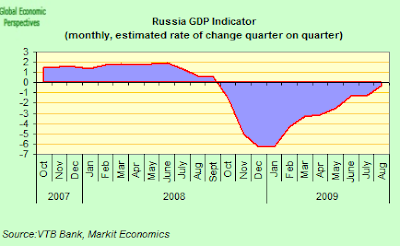 However the contraction evidently eased in the second three months of the year, and while the Russian Statistics Office do not publish seasonally adjusted estimates of quarterly movements in GDP, Neil Shearing at Capital Economics estimates the economy effectively moved sideways, with roughly zero percent growth (plus or minus a tiny fraction on either side). Moving forward into the thirds quarter, the best measure we have of the current activity level is the GDP Indicator compiled for VTB Capital by Markit Economics on the basis of their Composite PMI. Interestingly, the Indicator moved back intopositive territory in August, posting above the neutral level of 50.0 for the first time since last September. That said, the latest reading of 52.2 suggested only a moderate rate of expansion in activity, and remained well below the long-run series average, while both the contry's services and manufacturing sectors posted equally modest month-on-month gains in activity. So we could say the economy continued to move more or less sideways on the month with the quarterly rate still standing at the slightly negative minus 0.2%. Now while the GDP indicator continued to show quite a strong year on year contraction in August of minus 3.9%, this was well down on May’s revised record rate of minus 9.9%. So while the Indicator has now spent nine months in negative territory - a longer sequence than the earlier seven-month record run from September 1998 to March 1999 - as companies produce direct for new demand, and government stimulus spending has its effect, the rate of contraction has eased notably. But it is worth noting that the current average rate of decline - minus 6.4% - is much sharper than that seen in the 1998 downturn, while we should be asking ourselves, absent a clear rebound in energy prices, just how sustainable the current improvement is. Over the second quarter as a whole, the Indicator averaged a revised annual minus 9.2%, far worse than the annual minus 6.2% posted in Q1. The first two quarters of 2009 have seen steeper contractions than in any previous quarter since the current time series began in June 1998. However,the Indicator does show a slower rate of annual decline for Q3 since the average so far, is minus 5.2% over July-August. 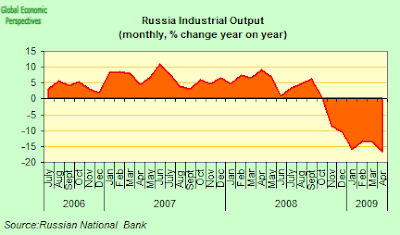 Russian industrial production rose for a second consecutive month in July, and the year-on-year decline eased after the central bank cut rates and the government ramped up spending. Output rose 4.7 percent from June, after a 4.5 percent rise the previous month, and on an annual basis declined 10.8 percent compared with 12.1 percent in June, according to the Federal Statistics Service. 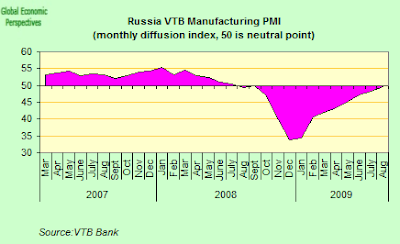 VTB’s Russian Manufacturing Purchasing Managers’ Index also advanced in August to 49.6 from 48.4 July. 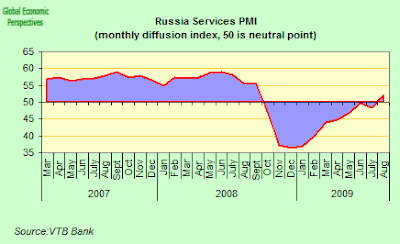 In addition Russia’s services sector returned to growth during August. Both the level of activity and amount of new business rose for the first time since last September, resulting in an overall improvement in the business climate. Employment continued to fall, but the rate of job shedding was at its slowest in ten months. Costpressures intensified again, but remained subdued whencompared against the long-run trend for the survey. The August services PMI rose by 3.7 points, reaching 52.2, ending a ten-month sequence of decline in the service sector. That said, the survey organisers were at pains to point out that the latest figure still pointed to a relatively muted rate of expansion compared to the survey’s long-run trend. Russia's unemployment rate has been declining recently after reaching its highest level in more than 8 years (8.8%) in April. The unemployment rate continued to decrease in August in all Russia’s 47 regions, according to the latest statement from the Russian Ministry of Health and Social Development. 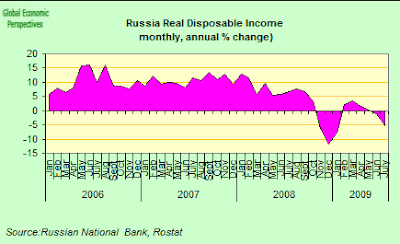 Still, the current 8.2% rate is still very high by Russian standards. Household income which had begun to strengthen following last winters dramatic fall, began to weaken in late spring and was down 5.4% year on year in August, providing additional evidence that the stimulus spending isn't working out exactly as intended. 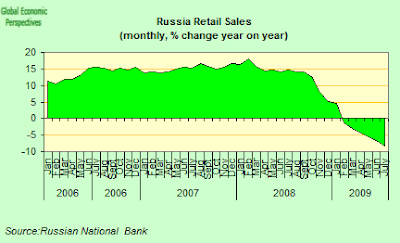 And so, not surprisingly Russian retail sales dropped the most in almost ten years in July, sliding for a sixth consecutive month, as households cut back spending in response to falling income and limited consumer borrowing possibilities. Sales slid 8.2 percent from a year earlier after declining 6.5 percent in June, according to the Federal Statistics Service. 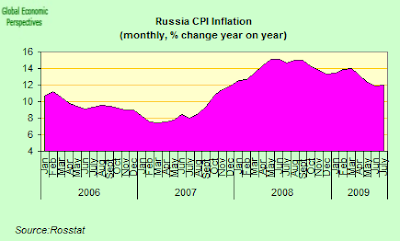 The best think that can be said about Russian monetary policy instruments is that they are hopelessly ineffictive. Even though August consumer-price growth was probably much lower than July’s 12 percent pace it is still extremely hard to understand how incompetence can have reached such a level that an economy which has been contracting at more than 10 per cent a year can still have double digit consumer proce inflation. There is no other word for it, this is a mess. Producer prices at least have been falling, and slid again in July for the eighth consecutive month as industrial production slumped and companies competed by discounting products amid waning demand, according to the press release from the State Statistics Service. The price of goods leaving factories and mines was in fact down a record 12.3 percent compared with July 2008 after sliding an annual 9.4 percent in June. The pressure on wages and incomes is thus easy to see. What is not so easy to see is why domestic prices take so long in responding to these signals and the Economic Development Ministry still expects inflation to range from 12 percent to 12.5 percent in 2009 from last year’s 13.3 percent. Stunning! 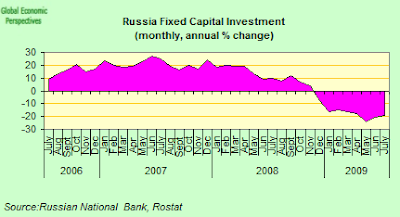 Now suprisingly one of the biggest problems Russia faces as a result of this very disorderly contraction is a sharp fall in capital investment, which is dropping steadily almost with no relief. Down 18.9% year on year in July. So, as the Federal government pounds in stimulus after stimulus, while oil prices however in the $70 dollar a barrel range, the country now risks returning to a period of entrenched budget deficits that may threaten its credit rating and lead directly to further ruble devaluation. The country faces “still-substantial risks to public finances due to the severe economic contraction” and financial risks linked to “stress” in the financial industry and liabilities of state-run companies, according to Standard & Poor’s analyst Frank Gill. According to Gill, if the government fails to rein in the budget shortfall, the credit rating may be cut from its current BBB rating. Russia's budget deficit widened in the first eight months of 2009 to the equivalent of 5.9 percent of GDP, according to Finance Minister Alexei Kudrin following a shortfall of 4.3 percent in the first seven months. The expectation now is that the deficit may come in at around 8.9% of GDP on the whole year. On the other hand the government stimulus plans involve an average outgoing of between 850 billion rubles ($26.8 billion) and 900 billion rubles a month this year following a 1.5 trillion ruble jumpstart in December. In its attempt to plug the gap the government is drawing on its $85.7 billion Reserve Fund and $90.7 billion National Wellbeing fund, which were built on windfall oil revenue, tin order to pay for an “anti-crisis” program that estimated to be worth about 2.5 trillion rubles ($79 billion) you include the tax breaks, central bank lending and all the other multifarious measures. With the Reserve Fund expected to be drained by the end of next year, Russia will need turn to international debt markets for the first time since 1998, and is seeking to raise $17.8 billion from investors next year, according to Alexander Kudrin. This will mean the country’s debt to GDP ration - which is still very, very low by international comparisons - will more than double by 2012, growing from 6.5 percent of GDP in 2008 to 16.4 percent by 2012 according to Finance Ministry estimates. Well, one way not to solve the problem would be a ruble devaluation according to European Bank for Reconstruction and Development Chief Economist Erik Berglof. Even while recognising that the country has a very difficult couple of years in front of it, Berglof argues “this (devaluation) is the wrong way to think about the recovery in Russia”. Well, this is eaxctly the point, and is why I have been arguing over the last two year about how all those wage increases which the Russian administration seemed to rejoice in (since they bought short term popularity) simply fuelled domestic inflation and in the process did untold damage to domestic competitiveness. However it is evident Russia's industries cannot now simply be transformed overnight, and this is where I find a weakness in Berglofs argument, since some remedy is needed to straghten out the distortions and get of commodity export dependence. But what? If it isn't devaluation, then surely we will need to see very substantial wage deflation in order to attract the now much needed inward foreign investment. Of course not everyone agrees with Berglof, and the Russian Association of Regional Banks, whose 450 members include the Russian units of Barclays and Citigroup, has called for a devaluation of as much as 30 percent. Billionaire Vladimir Potanin, realist and owner of 25 percent of OAO GMK Norilsk Nickel, said in recent interview with the Russian Newspaper Vedomosti that the “interests of the economy” will lead the currency to depreciate in the “mid term,” allowing exporters to cut costs and modernize production. Nonetheless energy, including oil and natural gas, accounted for 69.1 percent of exports to countries outside the former Soviet Union and the Baltic states during the first seven months of this year, according to the Federal Customs Service, while metals were responsible for another 12%. So the commodities dependency is massive, and this situation can't be turned round easily. 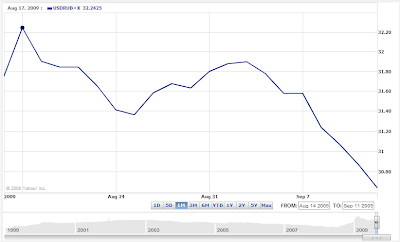 Getting Carried Away By Global Liquidity? 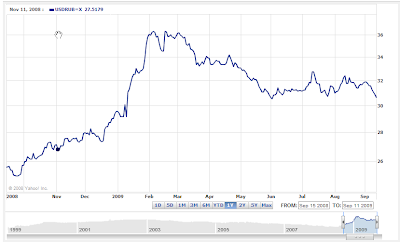 Bank Rossi are also not 100% convinced by Berglof's reasoning, as witnessed by the fact that they facilitated a 35 percent depreciation in the ruble during the second half of last year (see chart below), and as the collapse in raw material prices and the dramatic change in local credit conditions first pushed Russia's economy into recession the ruble’s trading range was widened to between 26 and 41 against the dollar-euro basket. However the central bank is now locked on the horns of a massive dilemma, since as risk appetite returns, with it comes the enthusiasm for buying the so called "high yield" currencies - like the South African Rand, the Russian ruble and the Hungarian forint. Instruments denominated in all these currencies offer investors substantial returns at the present time thanks to offering some of the highest interest rates among globally traded currencies. Indeed buying Russian rubles was one of the key recommendations made by Angus Halkett, currency strategist at Deutsche Bank in London, in a research report published back in April, and the market seems to have followed his advice The so-called carry trade works by investors borrowing in currencies with low interest rates and good prospects of continuing depreciation (the USD at the moment, for example) in order to buy higher-yielding assets, in countries with high domestic interest rates and continuing prospects for ongoing appreciation. In general, engaging in one or other form of the thousand-and-one-varieties carry trade is pretty standard practice during times when returns for real economic activity are low, and central banks hold down rates and supply liquidity. Indeed we may include here the kind of carry practiced by banks in borrowing from the central banks only to then lend - for a small, but very low risk, interest rate commission - to their national government, who at this stage in the business cycle will normally be running a fiscal deficit. So more than funding recovery, the watchword at the moment is very much "carry on carrying". But for those on the receiving end, the consequences of so much carry are far from innocuous, since the process simply funds all sorts of economic distortions, and far from allowing normal market corrections to occur, it simply amplifies the problem. And this is exactly what is starting to happen now in Russia. The ruble had its biggest weekly advance in more than three months last week as risk sentiment rose, following industrial output data from China, which is now the world’s second-largest energy user, which simply showed output increased at a faster pace than forecast. As a result the ruble tends to rise as risk sentiment does, and in particular as economic data exceeds consensus expectations, and the currency has now been on an upward trend since mid-August (see chart below), gaining 0.7 percent to 30.6629 per dollar last Friday alone. This was the highest close since July 27. Over the week as a whole the ruble appreciated 3.1 percent, the most since the week ending May 22. So things are now becoming very detached from the so called "fundamentals" (whatever those might be in the topsy turvy world in which we now live), since it simply is not plausible that the currency should be rising in this way in a country with 12 percent consumer price inflation and which badly needs to move away from commodity export dependency. The only conclusion which could be drawn is that the Russian economy now needs massive structural reforms, and on any imaginable scenario in the world in which I live these are simply not going to be implemented. Bad Loans About To Surge? We also need to consider what is going on in the banking system. According to the lastest report from Standard and Poor's Russian banks currently face “increasing system-wide risks” as loan quality deteriorates and borrowers struggle to keeps their heads above water during the record economic contraction. S&P last week downgraded Bank Vozrozhdenie’s credit rating to B+ from BB- and Alfa Bank, Russia’s biggest private lender, was cut to B+ from BB- as a signal to the industry. As the ratings agency indicated, the inability of Russian companies to continue to make their debt payments will more than likely further stifle lending as banks channel funds into building up their reserves. OAO Sberbank, VTB Group and other lenders are also facing a surge in “troubled assets” that may total $213 billion, according to an earlier Standard & Poor’s report in June - with as much as 38 percent of all assets held by Russian banks possibly becoming problematic by the end of 2011. Russia's banks had already set aside 1.5 trillion rubles ($48.9 billion) in July to cover overdue debt, a monthly increase of 7.6 percent compared to a rise of 6.9 percent in June, according to the last statement from Bank Rossii (Sept. 1). Sberbank’s provisions for the rising debt reached 388.1 billion rubles, or 7.1 percent of total lending, as of June 30, according to the bank itself. The share of bad loans in the second quarter jumped to 6.4 percent from 3.5 percent in the first quarter, while year-to-date lending by the bank was only up 0.4 percent. At Bank Vozrozhdenie, S&P's estimate that about 15.7 percent of loans are “under stress,” S&P. The bank, which focuses on lending to small and medium- sized businesses, saw non-performing loans rise to 7.3 percent at the end of the second quarter, compared with 3.4 percent in the first three months of the year. Overdue bank loans in the system as a whole reached 5.5 percent of total lending in July, compared with 5 percent a month earlier, with overdue corporate loans jumping to 5.3 percent in July from 4.8 percent in June. The bank corporate loan books fell by 0.2 percent in July, while lending to households was down 0.4 percent for the sixth consecutive monthly decline. In this report we have identified how steady and systematic long term mismanagement of Russia's monetary policy how now created a veritable Procrustean bed of problems for Russia's economy and society. Failure to address the underlying inflation problem between 2005 and 2008 meant that large structural distrortions were accumulated in the economy, including a massive problem of commodity export dependence, a problem which effectively turned the country into a veritable disaster waiting to happen if ever there should be a protracted lull in the secular rise in energy prices. That lull has now arrived, and it is not at all clear just for how long we will all need to get to learn to live with it. Added to all this, the economy will clearly not rebound as easily as many seem to foresee. The Russian Economy Ministry seem to be getting ahead of themselves here, since only last week they raised their 2010 forecast to 1.6 percent growth from 1 percent. This would follow an anticipated shrinkage of some 8.5 percent this year. Economy Minister Elvira Nabiullina said on Sept. 9 output may grow 3.9 percent to 4.5 percent in the second half of this year compared with the first six months - and this I find hard to accept, unless the turnround in global economic activity turns out to be much stronger than the one we are currently seeing. 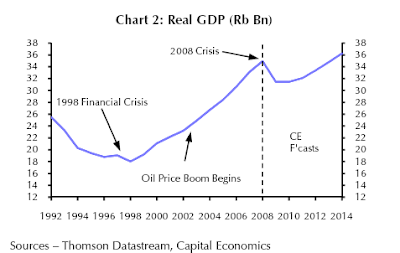 The consequence of this is that it will still be some years before Russian GDP even gets back to the 2008 level, as Capital Economic's Neil Shearing recently argued (see chart below). I also agree with Neil that while financing the Russian deficit is unlikely to add to the inflation issues (given the substantial output gap under which the economy currently labours) underlying inflation is bound to remain well above any reasonable comfort zone, and this will complicate policy decisions enormously. Financing the fiscal deficit - which looks set to top 9% of GDP this year and despite some planned fiscal consolidation is unlikely to fall much below 5% of GDP in2011 - is not a major problem for the government, although the issue of which currency to issue the inevitable bonds in will be, since the likelihood of devaluation at some point remains large - Neil Shearing expects the currency to fall by 10% against its dollar/euro basket over the next six months or so, breaching in the process the current lower bound of the trading range, and this it seems to me is a perfectly reasonable expectation. Of course, talk at this point of a return to the sort of chaos we saw in 1998 is certainly premature, especially with debt to GDP only just breaking the double digit frontier. But serious issues do lie ahead in 2010, not least of them how to recapitalise Russia's badly wounded domestic banking system, and how to refinance all the outstanding forex denominated corporate debt. Of course, if we are living a fairytale version of Alica in Dynamic Global Recovery land, then demand for Russia's commodity exports will surge again in 2010 and 2011. But what is we aren't, and demand remains muted, or more financial problems break out on Europe's perfifery? Perhaps the prudent investor will be able to spare the time to give just a little thought to the likelihood of this second, and definitely less apetising scenario.